About 58,600 Rohingya have fled into neighboring Bangladesh from Myanmar, according to U.N. refugee agency UNHCR, as aid workers there struggle to cope. “A total of 2,625 houses from Kotankauk, Myinlut and Kyikanpyin villages and two wards in Maungtaw were burned down by the ARSA extremist terrorists,” the state-run Global New Light of Myanmar said. The group has been declared a terrorist organization by the government. But Human Rights Watch, which analyzed satellite imagery and accounts from Rohingya fleeing to Bangladesh, said the Myanmar security forces deliberately started the fires. “New satellite imagery shows the total destruction of a Muslim village, and prompts serious concerns that the level of devastation in northern Rakhine state may be far worse than originally thought,” said the group’s deputy Asia director, Phil Robertson. Rohingya refugees rest after travelling over the Bangladesh-Myanmar border in Teknaf, Bangladesh, September 1, 2017. 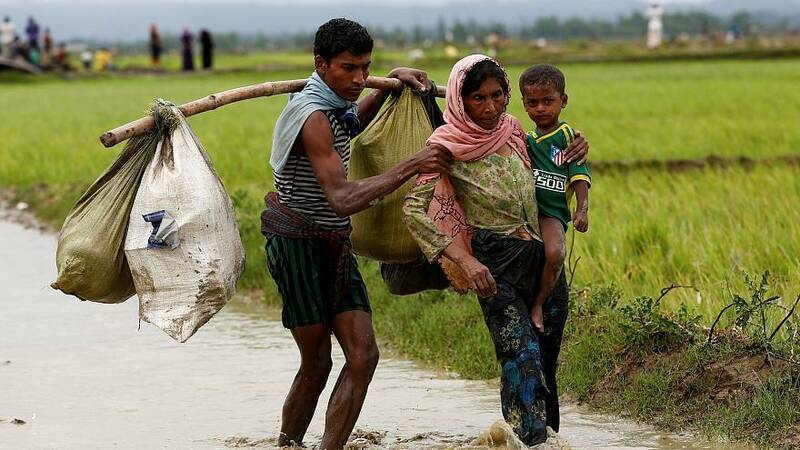 Bangladesh is also growing increasingly hostile to Rohingya, more than 400,000 of whom live in the poor South Asian country after fleeing Myanmar since the early 1990s. Many aid programs running in northern Rakhine prior to the outbreak of violence, including life-saving food assistance by the World Food Programme (WFP), have been suspended since the fighting broke out.